"Professor Leblanc's Handbook comes forth at an integral moment in the evolution of corporate governance. In the midst of increasing global demand for corporations to be responsible to employees, civil society, and the environment, the role of directors and shareholders in the creation of sustainable long-term value sits at center stage. The EU Directive, OPP21, and laws requiring quotas for women on boards are only the latest examples of citizenry demanding corporate sustainability and inclusion. Intolerance for the role corporations played in the financial crises of 2002 and 2008 now requires boards to go beyond consideration of strategy and C-suite succession planning and rise to the outcry for integration of nonfinancial impacts into the stewardship of long-term capital and value creation. Dr. Leblanc has assembled a first-rate list of global authors to explain why this movement is here to stay." 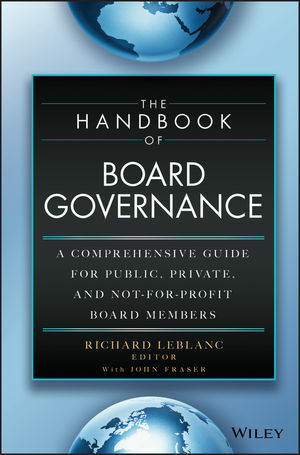 "The board of directors sits at the center of the governance framework in a wide range of organizations. This new Handbook will be an invaluable reference for both board members and academics seeking to deepen their understanding of boardroom functioning. The breadth and depth of the volume's coverage is both impressive and indicative of the challenges and risks faced by the modern director." "This Handbook is a truly comprehensive and invaluable compendium of governance best practices and insights. I have worked with Dr. Richard Leblanc for close to 20 years and have had the privilege to see him develop into a foremost mover and an informer of key governance practices and trends in Canada and internationally. He proves this again with the publication of The Handbook of Board Governance, which is a brilliant piece of work by contributors who span the who's who in the world of governance subject matter expertise. I think it should be on every director's and corporate secretary's desk." "Professor Leblanc has put together a very impressive array of authors for this Handbook, including Michael Useem, Dennis Carey, and Ram Charan, among many others. The field of governance is constantly changing, and wise directors should keep abreast of changes and their responsibilities. This Handbook is highly recommended to directors who wish to do that!"